Drug use in Dublin (1964 – 1972) | Come Here To Me! I’m currently doing research for an article in the CHTM! book on the history of drug use in Dublin from 1964 to 1972. The Irish Times, 09 Aug 1969. Primarily focusing on the psychedelic drug LSD and psychoactive drug Cannabis, it’s fascinating to read through The Irish Press, The Irish Times and The Irish Independent and see these types of drugs being talked about for the first time. You then see the establishment of the Drugs Squad in 1967 (led by the legendary Inspector Denis Mullins) and the general increase in both consumption and arrests relating to the drugs which cumulated in The Yeoman Inn raid in November 1972 which saw 36 police busting the South King Street bar and arresting 34 people. This is where my research ends. The Sunday Independent. November 19 1972. So far I’ve only been relying on newspaper articles. 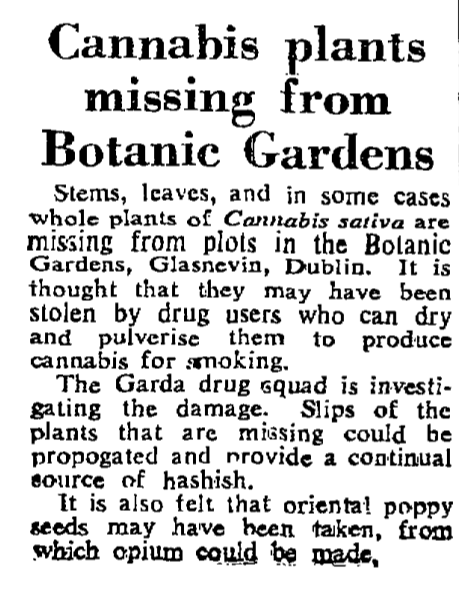 I’ve love to hear from anyone who may have any information relating to use of the use of LSD and Cannabis in Dublin in the 1960s and early 1970s. What kind of people were using it first, where were people using it, where were people getting it from etc. Obviously not looking for names or incriminating evidence (! ), just stories or anecdotes. If you can help, drop me a mail at ‘matchgrams(at)gmail.com’. Thanks. You’d do well to talk to my sister and her then husband, they knew Dinny Mullins very well and were absolutely up to their necks in it, but we were from very “good” and influential family’s so the charges were always dropped, I even managed to get a look in by the year 77, I visited(found) my sister in a piss hole of a council house, toilet leaked into the kitchen. After a few days there John walked straight into the room and jacked up in front of me. Glad I saw it now because it put me off needles for life, the sight of some one gouging post hit is nothing like as exciting as my first joint/drink session a few day before. also the barrenness of the house was terrifying, they had nothing but two tiny kids that lunged at your wrists to try and bite them. I have never since seen such tortured children. They are all most likely totalled while my sister and her hubby are sailing fair nicely, life is extremely unfair. His father had the same power as a government minister. I am sure some readers here would figure out exactly who I am talking about, there is loads more but it is truly a depressing scene and only romanticised by my extreme youth at the time and being allowed to take part in the deliberate theft of police men’s private cars, scoring a goal on the pitch with a Cortina is a great buzz at 14!! This might be of some help http://www.drugsandalcohol.ie/6639/ as might Shay Byrne’s book “Miracle Of Fatima Mansions” published a couple of years ago by Maverick House. I still have a copy of Smack if that’s any use. They banned it soon after it came out. I think it got too near the truth. As far as I could see the basic reason drugs took hold was due to short sighted small minded politicians who were more afraid of the political threat they saw in the Pushers Out movement. I knew guys who were dealing in Hash for years from the same locations. Once the Concerned Parents and the Pushers Out movements petered out the flood gates opened. It was bound to happen in a country run by farmers who though Grass was only used for silage. Shay told me that Dinny Mullins was known as Sargent Sunshine. He was a very humane man who understood that abusers needed help not prison. I can let you listen to interviews that Shay gave when his book came out in 2007, with Gerry Ryan on 2FM and Matt Cooper on Today FM. His description of a bad acid trip is chilling. I know people who dropped acid then, who felt that the experience was extremely enjoyable. I might be able to connect you.